Let me guess. You live in your skinny jeans year round and have come to think of them as the base to any and all of your casual outfits. Despite the fact that the denim trends of the moment are leaning in the exact opposite direction of skinny jeans (some are calling them “anti–skinny jeans”), we know that there’s still a place in your wardrobe for the classic denim style. I mean, let’s face it: They won’t be going anywhere soon. Now that we have that settled, let’s talk fall/winter outfits. The one combo you’re bound to wear endless times from now till April involves a sweater and skinny jeans. So, I took it upon myself to pull the coolest versions of the outfit on all of Instagram to serve as my inspiration for the coming months. You see, it’s a relatively simple combo, but I often find myself searching for ways to add style to it. Which shoes should I wear? Which color sweater looks best with the jeans? If you ever find yourself wondering the same things, the below outfits should serve as your ultimate winter wardrobe inspiration. 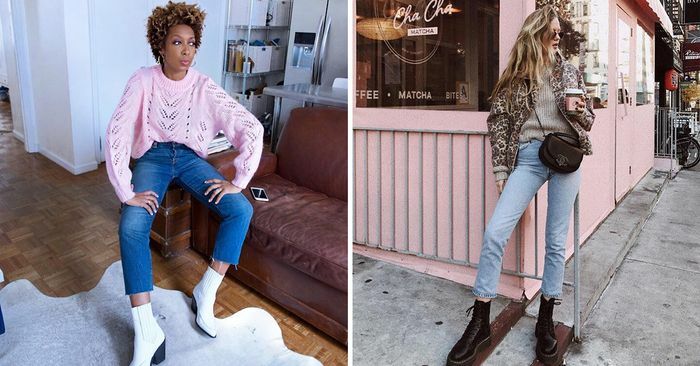 From the bright, chunky knit sweaters NYC girls are wearing to the simple cardigans that the French just adore, go on to see the sweater-and-skinny jeans outfits you’ll want to try, and then shop the pieces to achieve each look.